No winter is like the last one, even beyond the snow factor: Resorts grow and change, and as jobs, families and interests shift, our recreation routines get shaken up. But there's no reason to fear change—embrace it, with the help of our guide to the resorts and offerings of Utah's mountains. The resorts are switching it up this season. Several new ownership schemes are making waves, and efforts to up snow-independent offerings (e.g., snow making capacity, foodie options, specialty kid camps and summer activities) to mitigate the monetary impacts of climate change offer new options for wintertime fun. But that doesn't mean that good old-fashioned snow riding doesn't also benefit from the upgrades. With that in mind, we've noted 10 runs you should make a point of zipping down this season—for the first time, or the 1,000th. Before you get there, though, make sure to fuel up with some tasty grub—maybe a full-on breakfast and maybe some sugary, carb-y goodness. We call this "avant ski," and selecting an avant-ski spot is inherently more complex than choosing an après-ski destination. After a long day of rousting the powder, more or less any warm room offering food and alcohol will do. For pre-ski, however, one must consider the speed of preparation, choose between protein staying power versus sugar-rush, and then there's, of course, location, location, location—no one wants to go out of his or her way to fuel up on a powder day. We've taken the stress out of it with our picks for pre-ski noshing. Now, go forth and conquer the snow day! What's New: Deer Valley is throwing down $6 million on upgrades. A new restaurant, The Brass Tag, offers comfort food hot out of the brick oven, while the artisan-cheese operation in Silver Lake Lodge is expanding. Shiny toys include four new Cadillacs, expanded snowmaking infrastructure, 34 EPA-approved snowmobiles and five new snowcats ready for the nightly grooming prowl. Served by your choice of three quads, Tycoon starts at the very top of 9,400-foot Bald Mountain. A steep double blue, this is a lengthy groomed run that offers plenty of opportunities to veer off to more difficult trails during your descent. What's New: Vail purchased Park City Mountain Resort in fall 2014, bringing it into the Epic fold. Thus, a PCMR season pass now rates benefits at 22 resorts (including unlimited skiing at 12 Vail resorts in the United States). A restricted Epic Local version is also available (price TBD, $589 at press time). Plenty of popular events will be back this season, including Santa Comes Down the Town Lift (Dec. 13) and the family-oriented Snowasis carnival. A racing black that's just down the hill from Eagle Lift, this was renamed in honor of Park City's favorite son: two-time Olympic gold medalist Ted Ligety. The nickname has been associated with the run for years, as the Park City announcer would call it out after Ted's frequent victories as a youth. What's New: The killer season-pass deals doled out last season—the Epic and Epic Local (price TBD, $549 at press time)—are back. The deal allows unlimited access to 12 of Vail's resorts as well as 10 others spanning Europe and Japan. Dream Peak's Cloud Dine, usually bursting at the seems, is nearly doubling its indoor and deck seating. At the top of Ninety-Nine 90 Express, you get to Canyons' zenith ... at 9,990 feet. After a quick gaze, zip down into the bowl and the powder it holds. Red Pine will dump you into your choice of several double blacks, so make sure you're prepared before hopping on the quad up there. -Get up the hill and get in a few runs. When the hunger hits hard, amble over to Red Pine Lodge (435-615-2888, CanyonsResort.com). The no-fuss, cafeteria-style dining means you'll be back out on the mountain in a wink. While the food is good in general, it's the biscuits you're here for. Grab a stack and chow down before heading back out into the wintry fray. -More leisurely mornings are meant for the breakfast buffet at The Cabin Lounge (Grand Summit Hotel, 435-649-5400, CanyonsResort.com). Made-to-order omelets and waffles are hard to argue with, and all the usual suspects (i.e., bacon, sausage, pancakes, yogurt and granola, fresh fruit) round out a rib-sticking meal. The price tags here can be a little high, but you can always just eat more to make up the value. What's New: Season tickets include three free days at Brian Head along with year-round lift use (for hiking and biking tours come spring). Two punch-card lift-ticket options provide five days of skiing for the price of four ($295) or 10 for the price of eight ($550). The twilight race series is back, offering cool prizes and a chance to "beat the pros" at their own game ($12 participation, $10 lift ticket). Skiing Sundance? It would behoove you to hang out long enough for the Sunday brunch buffet at the Foundry Grill (8841 N. Alpine Loop Road, Sundance, 866-932-2295, SundanceResort.com). A lovely dinning room and killer views accompany a solid, savory brunch complete with carving stations and a dessert table (yes, breakfast dessert is a thing; a wonderful thing). The menu changes every week, but no one ever seems disappointed with the offerings. After gorging, hop on the hill. Powder-day jitters got you jonesing for a faster option? Take a few fresh turns, then head up the Ray's or Arrowhead lifts to Bearclaw Warming Hut (801-233-4157, SundanceResort.com). Crazy-pretty views surround this mountain-topping lodge and quick, yummy fare will keep your turns smooth and your belly happy. What's New: Brighton is going for a big bang-per-buck factor by keeping lift, rental and lesson prices affordable. A dozen or so freestyle terrain-park events will keep things lively, while night skiing offers long days of family fun. If you're a terrain junkie, you know about Brighton's offerings already. But if you have always wanted to try one of these parks where rails and boxes give the slope an obstacle-course feel, Pee-Wee is a great spot for beginners to see if this lifestyle is for them. What's New: An as-yet-unnamed run from the Sunrise Lift offers fresh terrain. Efforts to replace the Summit Chairlift are underway; a shiny new version should be in place for the 2015 season. Honeycomb Grill will be serving Sunday brunch this season. Oh, and the resort was just purchased by Deer Valley Resort, so full-season pass-holders at Solitude and Deer Valley will receive four days at the other resort. Twist! This is a cross-country trail. As far removed—in several ways—from Honeycomb Canyon as you can get at Solitude, Big Redman is a neat nordic loop through the trees, crossing over snowshoe trails and passing the famous yurt. It's part of a network of XC trails that no other Utah resort can match. What's New: The popular Corkscrew run, the only green run to access the Wildcat Base, mellows out even more with a newly graded slope. Qualifying season-pass purchasers will love the Wasatch and Reciprocity Benefits, granting three days at Snowbird and Deer Valley and 50 percent off tickets to Mountain Collective Resorts (MountainCollective.com). An old-school favorite at Utah's favorite old-school resort, Alf's might eat both your dignity and cat. Starting at the ridge and ending at the lodge, this demanding black will put you at center stage, so everyone will notice if you crash. Heading up Little Cottonwood Canyon to hit Alta's storied slopes? Hit the road a bit early and pull up at Albion Grill (Albion Base Lodge, 801-832-2500, Alta.com)—open 8 a.m. weekends and 8:30 weekdays for breakfast. A hot grill, housemade granola and a selection of yogurts and fruits get the job done while excellent views of the sunrise peeking into the valley below allow you to leisurely peruse your post-coffee runs. This is one of the most relaxing preludes to a first morning chair imaginable. Miss the early-morning breakfast mission? No worries. Hit the slopes, and hit them hard, before taking a serious timeout at the slow-food-supporting Collins Grill (Watson Shelter, 801-799-2297, Alta.com). Open midday (11:30 a.m.-3 p.m.), the grill offers white tablecloths, slippers, housemade bread, French country tarts (quiche! ), and yet another gorgeous vista, making it an ideal high-class pit stop to energize those afternoon laps. What's New: It takes a mountain village to raise little chargers, and the Bird is hard at it. The new Mountain School Kids Program (Dec. 27-29) teaches expert-level youngsters (aged 10 to 15) the secrets of big-mountain terrain management. And up-and-coming shred betties get an ollie up at the Girls Just Wanna Have Fun camp (Jan. 17-19) led by a group of charge-happy chicas. A new restaurant/restroom/ski patrol/hangout on Hidden Peak is under construction. It should be up and running by the 2015-16 season. Qualifying season passes rate the Mountain Collective benefits of 50 percent off lift ticket at six resort complexes. Do you like the tram but not the vast expanse of black diamonds lurking at the top? Chip's is your ticket down; a 2.5-mile blue that affords Snowbird's best terrain for a more moderately accomplished snow bunny. For a side adventure, jump into the tunnel near the top of Chip's and do one of the greens or blues over in Mineral Basin before coming back to Peruvian Gulch. General Gritts (Snowbird Center, 801-933-2222, Snowbird.com) offers on-the-go staples like hearty breakfast burritos and sandwiches. Popular breakfast bowls offer a refreshing twist on old favorites. The prices are reasonable, and you'll still have plenty of time to snag the first (or second) chair. To enjoy some slightly slower food, check out the Forklift (Snowbird Center, 801-933-2440, SnowBird.com). Here, about $15 will rate such perennial favorites as omelets, eggs Benedict, and blueberry whole-wheat pancakes, made-from-scratch. The food is tasty, and the tram is nearby, so taking a time out for a solid start to the day won't interrupt too much play. What's New: The Sundown Lift, accessing green, blue and black mountaintop terrain, is now a speedy modern quad. Powder Mountain is celebrating its 42nd anniversary by amping up value, offering $42 tickets every Wednesday. Locals ski mid-week for $54, as do season-pass holders for any other Utah resort on any day. College kids ski for $40 Monday through Thursday with a valid ID. Accessed from Cat Walk, Cobabe runs down the middle of its namesake before cruising along the resort's boundary down to Paradise Lift. This green serves as a fun tour of the bottom of the resort (you enter Powder Mountain at the top), one of the more serene areas here. What's New: The Dining Discovery program offers culinary expeditions and classes, while the snowpack will get a boost from 30 energy-efficient snow guns and three new cats. A new snowbarding park, the Burton Dinosaur Riglet, teaches 3- to 6-year-olds to ride while traversing lava and mountain landscapes, and the Learn & Earn program ($299) rates five lessons, rentals and a season pass. After a ride up Porcupine Lift, take a right and start cruising down this wide blue. Porky might feel a little casual for a while, but as you get closer to the bottom it gets steeper, allowing for some burnt powder on the approach to merging with the blue Mount Ogden Bowl. Picturesque mountain scenery in high-def, a piping-hot cup of coffee and a crispy waffle at the John Paul Lodge (888-437-5488, Snowbasin.com) is the only proper way to rest on a powder day. The Lodge, open 9 a.m. to 3 p.m., has waffles only until high noon, so don't let the opportunity pass you by. Hop on the first chair and carve up every fresh line you see. When all your favorite runs are tracked out, head in for your carb stoke before staking out those tree stashes. Not a bluebird day with a fresh foot? Take a slow morning and stop by Earl's Lodge (888-437-5488, Snowbasin.com) on the way to the lift, where you'll find your fill of hearty housemade fare. What's New: New owners, old name—Wolf Mountain back to its Nordic Valley roots. The ski area is also expanding, debuting four new intermediate-to-advanced ski lines this winter. While a lift is in the works for next season, all-terrain vehicles will lap the runs this year. Every Friday night after New Year's, a slopeside rail jam will offer prizes. The lodge has expanded seating and upgraded fare (gluten-free pizza, anyone?) And this is just the beginning of a five-year plan; stay tuned. What's New: The Beav is offering season-pass holders a bonus this year: three free days at Brian Head Resort. Well-known Logan caterers Justin Hamilton and Chip Lara are taking over the cafe at Beaver Mountain; expect delicious results. A student season pass ($325) is also available until Nov. 22. What's New: Well, everything: The whole resort is brand-spanking new. Three triple chair lifts access a family-friendly mountain complete with a magic carpet, tubing hill, night skiing, and ice skating. A snowmaking system will keep the hill frosty all winter long. What's New: Brian Head celebrates turning 50 this year, marking the occasion with a new high-speed Giant Steps quad lift that cuts ride times in half. A new terrain-based learning center will speed the progression from newbie to nonstop shredder. Season passes grant three free days at each of 11 U.S. resorts, including Beaver Mountain and Sundance. This green is fun any time, but we're specifically talking after dark. One of the night-skiing options at the top of the Blackfoot lift, Desbah is open to night owls Friday and Saturday from 4 to 9 p.m. Between runs, warm up at the gas fire pits at the bottom. The Breaking Bread Bakery (30 N. Main, Parowan, 435-477-9092) can be summed up in one word—handcrafted. Think really, really good donuts, made from scratch right down to the delicious frosting (maple, vanilla or chocolate), and just 70 cents each. The only downside? It's 20 minutes north of Brian Head Resort in Parowan. So even though it's grab & go fast, it might be a little out of the way for a early-morning start. But it's worth setting the alarm for: Aside from the donuts, breakfast options cover any pre-ski sugar craving imaginable (fritters, scones, cinnamon rolls), plus breakfast burritos. What's New: This is the first full season that the Little Eagle Lift will service the Tushar Ridge steeps. Park Lab, the resident terrain fest, has 12 new features to test out your tricks. 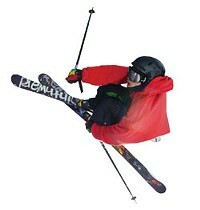 Anyone under 6 or over 70 skis free all season. Kids 6-17 ski free, except for holidays, with certain Eagle Point Reservation lodging packages.